Being mindful of the content we create and put out into the world has never been so important. With blog posts, social media feeds, newsletters, podcasts, and videos, we’re constantly, endlessly creating something new to share. The blogging landscape has changed dramatically. It’s more of a business than a hobby making it difficult to identify the real from the advertisement. Mindfulness can help us create better content. It helps us focus on our purpose and intention, who we’re creating for and why. Often the content we create is about sharing our lives with others and inspiring them to live a certain way. It’s important to mindful of the content we create, how we choose to share it, and the impact it has on those who consume it. 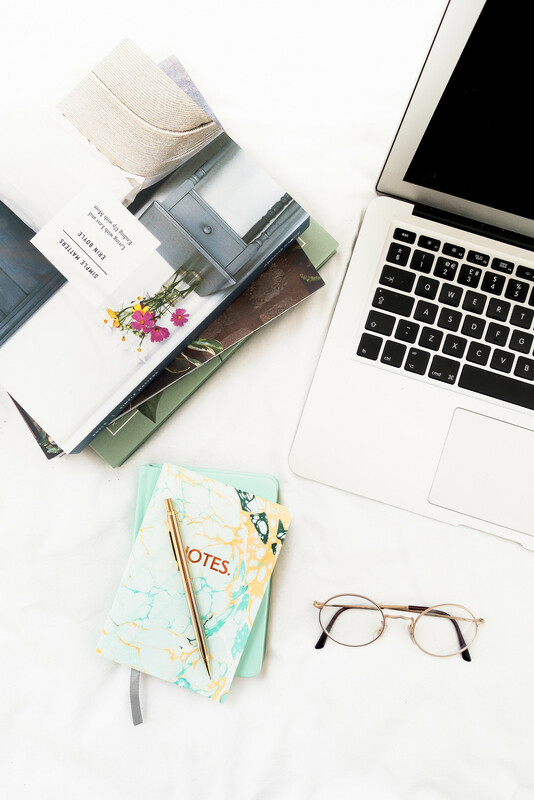 Blogging culture encourages writers to produce content daily with a rolling editorial schedule that can leave bloggers feeling overwhelmed and drained. There’s so much noise online, why add to it? It’s far more important to create purposeful content that contributes to your mission and its message rather than sticking to a blog schedule because you feel obliged to publish a certain amount of posts per week or on set days. Creating mindful content means having a clear intention that provides value for its readers. Consider what the purpose of your blog is: does each piece of content you create contribute to your mission? Does it have a purpose? How does the reader benefit from your post? Are you sharing a valuable experience or useful information? Knowing the purpose of your content and who you’re writing for means you’ll produce content readers will benefit from consuming. A huge motivation for my blog’s name change to A Considered Life was because I wanted to commit to creating mindful content, sharing how to live a life of compassion through making purposeful, intentional, and sustainable changes. It was a way of refocusing the content I was writing and the purpose of creating it. Having a clear mission for the blog and intention for the blog posts I was writing helped me create a platform that served a purpose and was more valuable for my readers. As bloggers who are often see as friends and allies, we have a personal responsibility to share with honesty; to be conscious of the brands we promote, the products we recommend, and the information we share. Honesty should be a priority. When it comes to sharing content online it’s important to be mindful of the collaborations we accept, the brands we promote, and the products we share because, in doing so, we’re endorsing them. We’re supporting their principles, morals, and values including the way they conduct business, the treatment of their workers, manufacturing methods, and final products. Always share with mindfulness by considering whether you agree with the practices of the brands you share and encourage your readers to support. When providing our opinion or sharing information, it’s important we’re mindful of the impact that may have. We have a responsibility to be aware of our influence by not encouraging consumerism or by spreading misinformation. 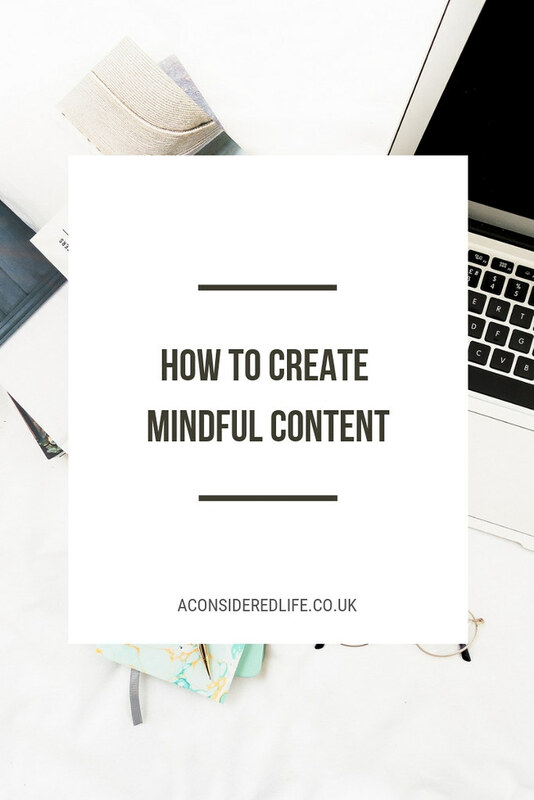 Creating mindful content means being aware of how we use our voice and whether our contribution is positive, ethical, and honest. If I can help someone find a product they love, that’s great. I work with brands I wholeheartedly endorse and share products I’ve fallen in love with, no strings attached. I don’t want to encourage unnecessary consumerism so from very early on I decided not to monetise my blog through affiliate linking or sidebar ads, and working only with brands who reflect my ethical values. I want to encourage positive lifestyle changes without encouraging people to buy stuff. Valuable content answers a question, gives information, shares an experience, or provides a resource. You don’t have to be an expert to offer your readers valuable content; sharing your personal experiences is just as important as providing factual information. Content created with mindfulness has value. A huge role in creating valuable content is identifying your niche and having a purpose. Having a strong passionate means you’ll have deep knowledge to share with your audience. Focusing on a niche will enable you to identify relevant, valuable content, build credibility and grow an engaged audience. Without a clear intention, your content will lack focus and hold very little value for the readers. Listen to the questions you're frequently asked and find interesting ways to answer them or share the information. The simplest way to add value to your content is to link to resources or provide evidence to support the information or opinion your sharing. Linking back to previous posts you’ve written on a certain subject provides valuable reading material for someone looking for help or an answer to their question. Sharing personal experiences, the pitfalls and mistakes as well as the success stories, is an important part of writing a blog for me especially one focused on living a compassionate lifestyle. I want to provide tips that are practical and goals that are achievable. It’s all about creating content that is encouraging, supportive, and useful for anyone looking to create a more mindful, compassionate, and wholesome life.